After the surprise discovery of Heurigen Kernbichler three months ago, my second Brettljause-search mission to Baden started on a wrong foot. Zierer, my originally planned destination, turned out to be a noisy, overcrowded location with no printed menu. Schwabl, where I walked afterwards, was a quiet, nearly empty place with no printed menu either. 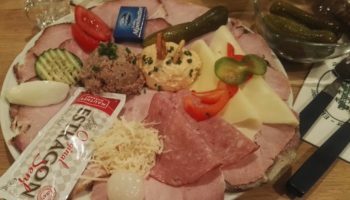 Both Heurigers had buffets, of course, where I could theoretically order any mix of Brettljause ingredients I wanted, but a rule is a rule: no printed menu – no review. Reviewing a self-made Brettljause is like reviewing one’s own hairstyle; if the review is bad, there is no one but oneself to blame. While crossing the center of the town, however, I noticed a tiny establishment that I didn’t remember having seen before. It had “Steira-Eck” written over the entrance, and it had Brettljause mentioned on a blackboard outside. Now, for me, the words “Styria” and “Brettljause” standing close together result in an irresistible call for action, which in this particular case meant hanging around for two hours until the restaurant opened. Steira-Eck is a very small place. There are only five or six tables inside, and all the visitors who arrived while I was eating, preferred to drink with the owners at the bar. It seems that the restaurant mainly caters for regular visitors, but the service is very friendly even if you are a stranger. The Brettljause was good, of course, but not as great as my unreasonable expectations wanted it to be. On the one hand, it looked wonderful, and the only disappointing part was the Schweinsbraten with a strangely bland taste. 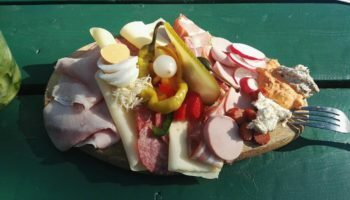 On the other hand, most of the the other ingredients – the Styrian “Volcano” ham, the “normal” ham, the tasty Bergkäse, the Grammelschmalz and the liver spread – failed to impress me. 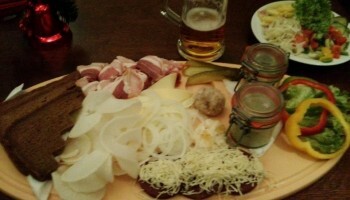 Only the Geselchtes and the hard Hauswurst tasted significantly above average by being dry and perfectly salted, though the cook’s decision to cut the Hauswurst into small slices was very questionable. The whole dish was like the horseradish it was served with: totally acceptable but not strong enough to be special. 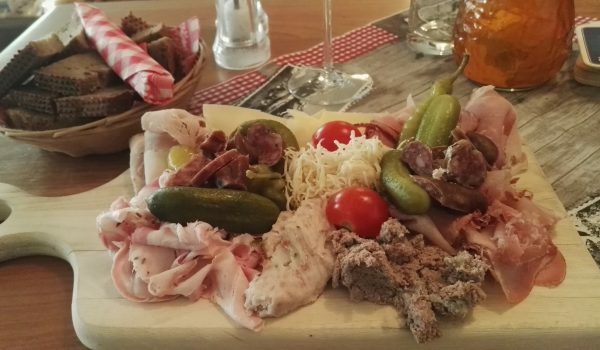 If it were up to me, I would have a Styrian Brettljause restaurant in every good-sized town, and it is very refreshing to see one opening in a sleepy place like Baden. 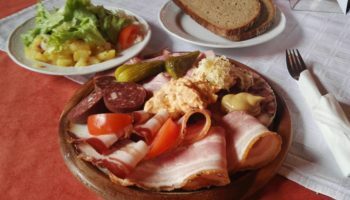 The Brettljause you get there may be better than 90% of Brettljausen in the 20-kilometer radius, but one still needs to travel to Styria to experience the real thing.